A new bike lane is pictured Oct. 18, 2018, at the intersection of Massachusetts and 14th streets. 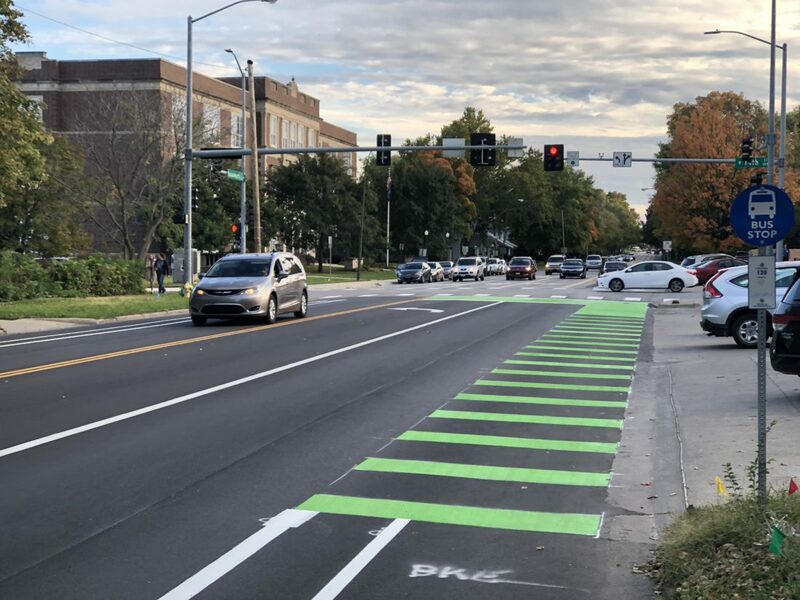 A different type of bike lane that changes the rules for both cyclists and drivers has been installed on a three-block portion of Massachusetts Street. The new bike lanes are wider and more visible than existing bike lanes throughout the city. They also include signage that restricts vehicles from turning right on a red light, as well as a new feature that a city diagram says is intended to make cyclists more visible at intersections. Instead of a single white line serving as a marker of the lane, the bike lanes resemble a crosswalk, with green stripes in places where bicycles and cars could cross paths. City crews installed the bike lanes this week along a recently repaved portion of Massachusetts Street, between 11th and 14th streets. New bike lanes are pictured Oct. 18, 2018, at the intersection of Massachusetts and 13th streets. 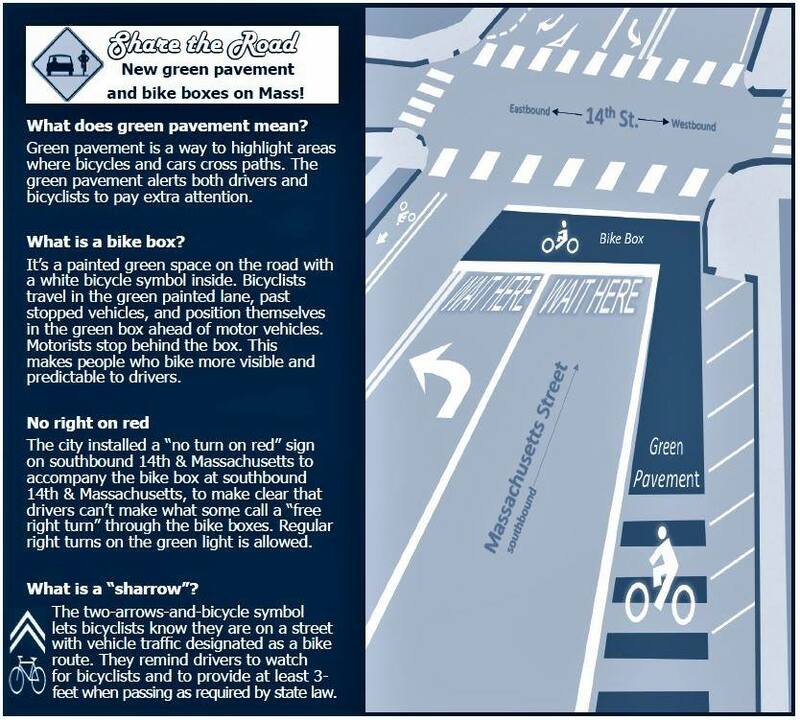 A key feature of the new bike lanes is the addition of a special box that’s designed to make cyclists easier for drivers to see when they’re stopped at an intersection, according to a diagram from the city. One such box has been added to the intersection of Massachusetts and 14th streets. 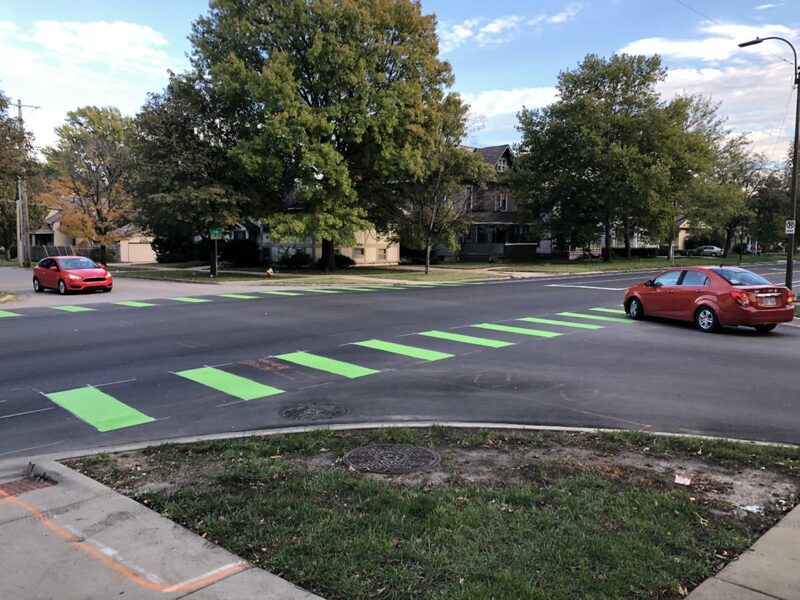 The box is painted solid green with a white bicycle symbol, and is in front of where cars stop at the intersection when the signal is red, according to the diagram. When cyclists stop at the light, they position themselves in the bike box, in front of the stopped vehicles, to make themselves more visible and predictable to drivers, according to the diagram. The city installed a “no turn on red” sign at the southbound portion of the intersection to make clear that drivers shouldn’t turn through the bike box unless the light is green.